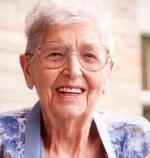 Wilda F. Myers, 92, of Julian and formerly of Clearfield, died Tuesday, May 6, 2014 at her home. She was born Dec. 14, 1921 in Williamsburg, a daughter of the late Aden and Berna (Sorrick) Showalter. Mrs. Myers retired from the Federal Savings Bank where she was the head teller. She had also been employed at CNB Bank, Clearfield. She was an avid bridge player. She also loved to travel with her husband in their RV, touring the United States in the latter years of retirement. She was a member of the St. John Lutheran Church, Clearfield. She is survived by two children, Stanley Myers and his wife, Iris of Clearfield and Pam Reggio and her husband, Anthony of Julian; and several grandchildren and several great-grandchildren. In addition to her parents, she was preceded in death by her husband, Charles K. Myers, on Feb. 2, 1995 and whom she wed June 12, 1940 in Williamsburg. She was also preceded in death by son, Daniel Myers and two sisters, Helen Jasoy and Lois Detwiler. Funeral services will be held at 10 a.m. Monday at the Kevin A Beardsley Funeral Home, Clearfield, with the Rev. Robert J. Way officiating. A committal service will be held at 1:30 p.m. Monday in the Fairview Cemetery, Martinsburg. Friends will be received from 6 p.m. – 8 p.m. Sunday and from 9 a.m. – 10 a.m. Monday at the funeral home. The family suggests that memorial contributions be made to the St. John Lutheran Church, P.O. Box 1545, Clearfield, or to the charity of choice. Obituary Notice: Jerry L. Bennett Sr.